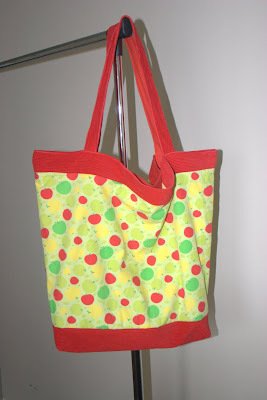 Have a look at the really big tote bag for the beach/picnicking in the park that I finished last week. I was so keen to get sewing it that I forgot to take any photo’s of what the materials used to look like, which I am now kicking myself for. The apple print fabric was the skirt part of a little girls dress, I just unpicked it from the top bib part and cut of the side seams. For some reason it was made with the print upside down! 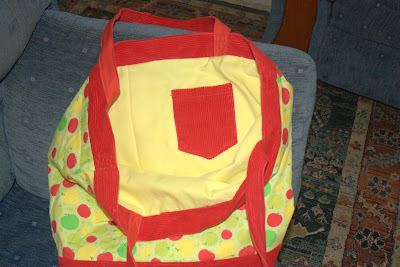 This was a bonus for me as it meant it was the right shape I wanted for my bag when turned the right way up. The red corduroy fabric was from a pair of toddlers overalls that have been in my fabric hoard for years, I think my little brother may have worn them at some stage; obviously not for very long though as they were like new. The pattern I made for this was fairly basic, just two sides joined together and boxed out at the bottom. I also lined it and put in a little patch pocket, taken straight off the overalls. Now I’m off to the beach, the weather is lovely here in Auckland…well actually today it’s a bit cloudy but it’s still very hot.